“Let’s go kill some vampires.” Syfy has just announced the season three premiere date for Van Helsing. The supernatural drama follows Vanessa Van Helsing (Kelly Overton), a descendent of the famous Dracula vampire hunter Professor Abraham Van Helsing. The cast also includes Jonathan Scarfe, Christopher Heyerdahl, David Cubitt, Vincent Gale, Rukiya Bernard, Trezzo Mahoro, Tim Guinee, Laura Mennell, Paul Johansson, Aleks Paunovic, and Hilary Jardine. 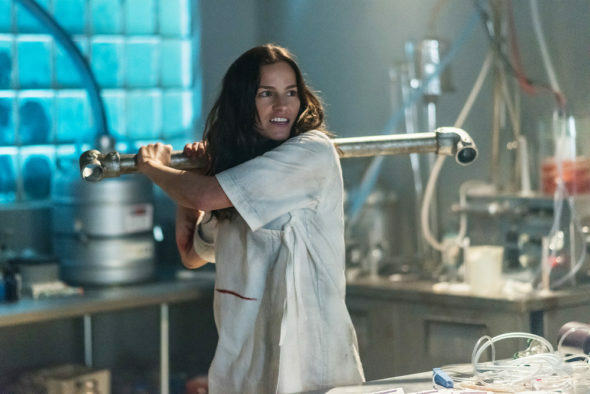 Season three of Van Helsing premieres on Syfy on October 5th at 10 p.m. ET/PT. What do you think? Have you seen Van Helsing? Will you watch the new season? More about: Syfy TV shows: canceled or renewed?, Van Helsing, Van Helsing: canceled or renewed? Great show. Written well. Great distraction from everyday life.